In the Martin & Sylvia: Saturdays! story “Great Scarecrow Mystery,” brother and sister are delighted to find scarecrows popping up all over town. 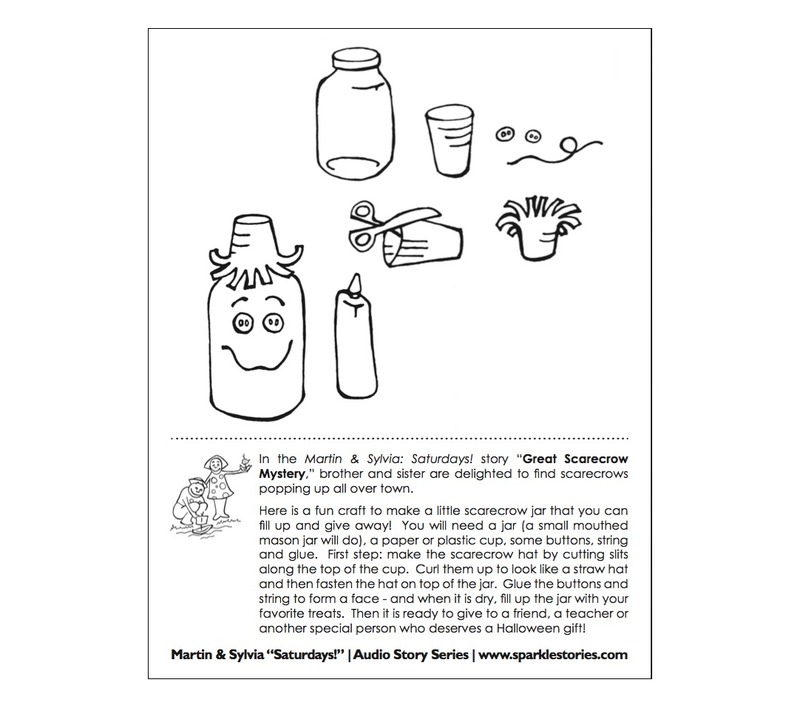 Here is a fun craft to make a little scarecrow jar that you can fill up and give away! You will need a jar (a small mouthed mason jar will do), a paper or plastic cup, some buttons, string and glue. First step: make the scarecrow hat by cutting slits along the top of the cup. Curl them up to look like a straw hat and then fasten the hat on top of the jar. Glue the buttons and string to form a face - and when it is dry, fill up the jar with your favorite treats. Then it is ready to give to a friend, a teacher or another special person who deserves a Halloween gift!